It is very easy to slip into a routine and perhaps start being less active with our pets than we should be. NOW is a great time to address one of the most common health problems seen at the veterinary clinic: obesity and overweight pets. Animals that are overweight are much more likely to develop diseases than animals which maintain healthy body weight. Animals with healthy weight live longer than overweight animals. Common diseases related to being overweight include: arthritis, respiratory compromise, type 2 diabetes, and hepatic lipidosis. 1. Arthritis--Overweight animals continually put excess strain on their joints. This extra strain leads to joint degeneration which creates pain. This is a compound problem because as animals become more painful, they are less active, and thus tend to become more overweight. In many cases, weight loss alone can eliminate the need for arthritis medications. 2. Respiratory Compromise--overweight animals have an inch or two of fat covering the chest making it more difficult to take deep breaths and lungs cannot fully inflate. This limits activity, especially in heat. 3. Type 2 Diabetes--Extra body fat contributes to insulin resistance which can result in diabetes. 4. Hepatic Lipidosis--When overweight kitties go off food for any reason, body fat is broken down to provide energy. 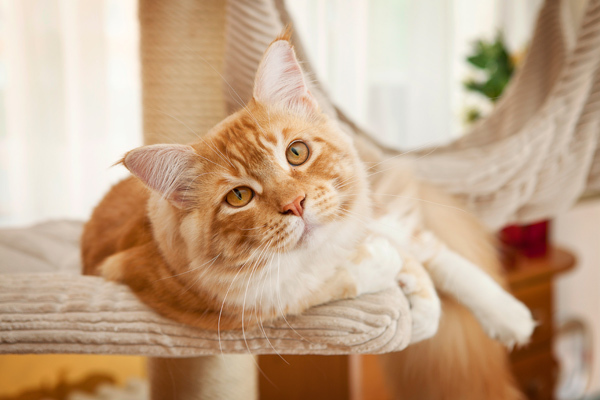 Cat liver cannot process this energy, the fat gets stored in the liver and functioning liver tissue is lost. This can be life-threatening within a few days. Pay attention to treats! For many people, feeding treats is a major part of the human-animal bond and they do not wish to give it up or reduce it. Pet treats are often high in calories. Be creative: use vegetables as treats to cut back on calories, or reward your dog with a long walk instead of that cookie. Feed appropriate food. Cats are carnivores and dogs are omnivores. Feed in meals. Free choice feeding encourages snacking and therefore contributes to weight gain. Increase activity. There are many ways to do this, consider interactive toys. Rule out or treat any contributing health issues. Metabolic disease, especially low thyroid hormone levels, can contribute to weight gain.